High School announcements would go here. Hawk Fans – Get your playoff gear today! To access the Hawk Shop online store and order your football playoff gear, please visit the school website for the store link or follow the link to www.tig2estore.com/lshawks. The order period for playoff shirts will close Monday, October 22 at 8:00 AM. Orders will be ready to be picked up on Thursday, October 25, in the art gallery from 5:30-6:30pm. #WeRFast. 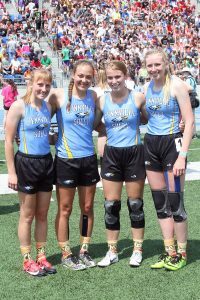 Lynnville-Sully Girls Track and Field Coach Darin Arkema posted this hashtag on the first day of the 2018 Iowa High School State Track and Field Meet on Thursday, May 17, and it was one that was repeated time and again as L-S track stars won state titles, broke state, school, and personal records, and stamped their names in school history over the three-day competition. 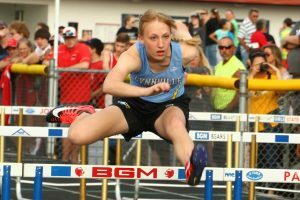 Lynnville-Sully track and field athletes couldn’t have asked for a more thrilling and rewarding end to their already outstanding season last week. 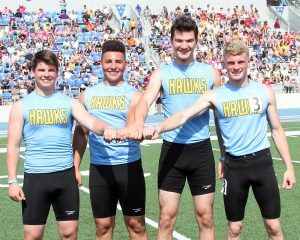 At the Iowa State Track and Field Championship, the Hawks proved themselves as the best of the best by winning two state championship events and made history with one new state record and five new school records. A total of 17 L-S students competed in 14 state events. Tyson Vander Linden, Class 1A 400-m hurdles state champion. 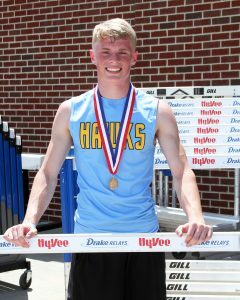 Junior Tyson Vander Linden was a double state champ, bringing home gold in both the 400-m hurdles and the sprint medley. He became the first L-S state champion since 2014 after winning the 400-m hurdles on Friday in a time of 53.07, one of the best times ever run in Class 1A. He shattered his own school record of 53.79, set earlier at the Drake Relays. Vander Linden’s win set the tone for the sprint medley final on Saturday morning. Seniors Sage Zylstra and Corey McCoy, junior Nate Stock, and Vander Linden earned their gold medals in an exhilarating finish, chasing down the state leader in the final stretch. The boys’ time of 1:33.83 destroyed the school record set last year by two seconds and beat the all-time 1A state record. 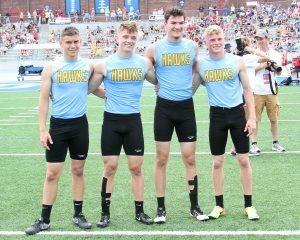 The sprint medley team of Sage Zylstra, Nate Stock, Corey McCoy, and Tyson Vander Linden chased down the state leader and ran a Class 1A and school record-breaking 1:33.83 for Lynnville-Sully’s second state title at the 2018 Iowa State Track and Field Meet. As a team, the L-S boys finished in seventh overall with 31 team points, which was a “great end to our season,” noted L-S Boys Coach Mike Parkinson. The Hawk girls placed 13th as a team with 17 points. This is the highest placement and most points the L-S girls have had at state since Coach Darin Arkema became head coach 11 years ago and is one of the best girls team finishes the school has had. L-S boys and girls were equally successful in the shuttle hurdle with both relay teams coming in as runner ups. In the girls’ race, sophomores Abby Gruver and Mallory Loftus and seniors Mariah Vos and Camryn Russell had great exchanges, technique, and focus to take second in their heat. Their time of 1:08.69 was not as fast as the winner of the first heat, but shortly after it was announced that that team was disqualified, putting the Hawks in second. This is the highest finish earned by L-S girls at state track in any event in school history. In the boys’ shuttle hurdle, senior Carson Dunsbergen, Vander Linden, McCoy, and junior Gage Vander Leest set a school record and qualified in first with a blazing time of 58.50 during the prelim on Thursday. On Saturday, they earned second in the finals with a time of 59.09. L-S hurdlers made their mark at the state meet in other events as well. About an hour after anchoring the shuttle hurdle, Loftus ran a personal best time of 16.00 in the 100-m hurdles to earn fourth on Saturday, edging out two close runners with an impressive final finish. This was after qualifying in eighth during the prelim on Thursday. The girls shuttle hurdle team of Abby Gruver, Mariah Vos, Camryn Russell, and Mallory Loftus finished in second place. “Her time was just .03 off the school record that I believe with continued work and effort she can eclipse on her way to more top state finishes,” Coach Arkema said. In the boys 110-m hurdles, Vander Leest ran his fastest time ever, 15.21, to place sixth in the state on Saturday. Two hurdlers – Gruver and Vos – represented L-S in the same heat of the girls 400-m hurdles on Friday. Gruver was a state qualifier in the event last year, and Vos qualified for it in 2016. Both were looking to improve from their first trips to state, and that they did. Gruver broke her own school record to place seventh with a time of 1:08.27, and Vos ran a personal best time of 1:09.61 to place 11th. Coach Arkema was thrilled to see them finish the season with their best times and to see Mariah battle back this season after missing a lot last year due to injury. The L-S girls earned points from one other event at state – their last event at the meet, the 4x100. In the prelims on Friday, sophomore Kaleah Ehresman, Russell, freshman Korinne Jansen, and senior Jataya Meyer dropped 0.27 seconds off their season best time to qualify for the finals in eighth. On Saturday, the 4x100 final came after about a two-hour weather delay. The girls regrouped and earned a seventh-place finish in 52.80 seconds with Meyer racing hard down the homestretch. Two L-S events were just one spot away from earning points and qualifying for the finals. In the girls 4x400 prelim on Friday, the Hawks gave a gutsy effort to finish in 4:13.33. Team members were freshman Caitlin Alberts, Loftus, junior Carson Fisk, and Gruver, who had already run the 400-m hurdles earlier that day. The girls’ time broke the school record from 1999 and was the ninth-fastest prelim time. Unfortunately, they missed qualifying for finals by six-hundredths of a second. The L-S boys 4x400 team experienced the same disappointment of being one spot short of qualifying for the finals. Dunsbergen, McCoy, Vander Leest, and Vander Linden recorded a time of 3:31.01 to place ninth in the prelim on Friday. The boys shuttle hurdle team of Carson Dunsbergen, Gage Vander Leest, Corey McCoy, and Tyson Vander Linden finished in second place. L-S earned a couple of 10th-place finishes in the field events. Junior Rylan James threw the shot put just under his personal best, coming in 10th overall with a throw of 48’0.75”. Drake Ehresman was in a great battle for points in the high jump, setting his personal best mark of 5’11” and finishing tied for 10th place overall. The L-S boys had a 16th-place finish from McCoy in the 400-m hurdles, the event won by Vander Linden. McCoy came in 16th with a time of 57.27. The L-S girls sprint medley relay finished 17th overall after making it to state with the 22nd best time. Ehresman, Meyer, Fisk, and Alberts had quick exchanges as they clocked a time of 1:56.89. The L-S state competitors and coaches appreciate the unbelievable support they received throughout all three days of competition at Drake Stadium. 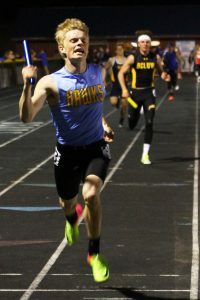 Hawk pride soared high among track teammates, friends, parents and family members, community members, and track alumni. Lynnville-Sully junior Tessa Van Maanen battled it out for 18 holes of golf at Nashua Town and Country Club on Monday, May 21, during the Class 1A regional final to tie for eighth place. She won the card back handicap hole going back four holes and advanced to the state meet to be held May 29-30 in Marshalltown. Van Maanen carded a 94 at the regional final. A three-time conference awardee, this is Van Maanen’s first trip to the state golf tournament. Van Maanen was joined by Kayla Van Dyke, Hailey Scandridge, and Skyler Young, who placed ninth as a team. Van Maanen is the sole Lynnville-Sully golfer to advance to the state meet. 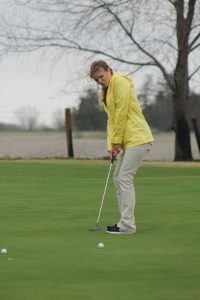 What started as a rainy morning turned into a great day for golf as Lynnville-Sully’s Tessa Van Maanen earned herself a place at the state tournament. On Monday, May 21, the Hawks traveled over two hours to compete at Nashua for the second round of regionals. Tessa Van Maanen drives the ball at the Class 1A regional final. Van Maanen carded a 94 to advance to the state meet May 29-30. Van Maanen, a junior, came out strong, shooting a 46 going out and a 48 coming in. Her total, 94, tied her for eighth place. Van Maanen was able to win the card back handicap hole, going back four holes. Fellow junior Kayla Van Dyke shot a 70 on her first round of nine and ended the day carding a 135. Senior Skyler Young found trouble on hole six but came away with a 137. Classmate Hailey Scandridge trailed by one stroke, shooting 138 on the day. As a team, the Hawks placed ninth out of nine teams with a team score of 504. The season is now over for all Hawks except for Van Maanen, who will play at the Class 1A Iowa Girls Golf State Tournament next Tuesday and Wednesday, May 29 and 30, at the American Legion Golf Course, Marshalltown. 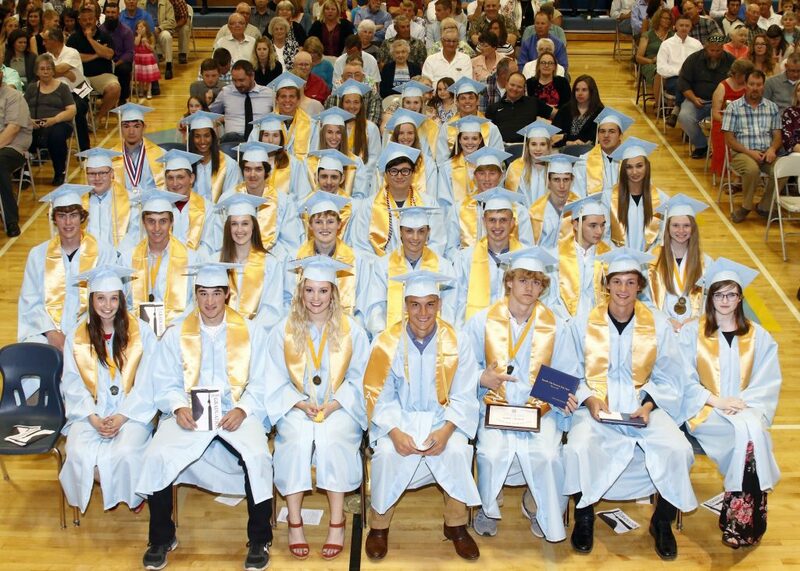 Thirteen years of hard work and accomplishments in and out of the classroom were celebrated for the Lynnville-Sully Class of 2018 during commencement exercises on Saturday evening, May 19. Family and friends filled the L-S gym for the 35 graduates who walked across the stage to receive their high school diplomas. The much-anticipated event was made more interesting as state track and field participants and their families raced back from Des Moines due to the rain-delayed state meet. Thankfully, all members of the graduating class made it just in time. Commencement began with the processional, superintendent Shane Ehresman welcomed all in attendance, and school board president Tim Dunsbergen announced the Citizens of the Year, Steve and Linda Russell. Lynnville-Sully Class of 2018: First row, Haley Breeden, Elijah Collins, McKinley Conover, Carson Dunsbergen, Josh Dunsbergen, Drake Ehresman, Makayla Ford; second row, Tanner Foster, Cody Gibbs, Daphne Hackert, Brevin Hansen, Corbin James, Holden Jansen, Cayden Johnson, Madison Johnson; third row: Daniel Keen, Kole Kinion, Corey Kramer, Jacen LeCompte, Nathanael Lirio, Kemper Lukehart, Brett Maasdam, Taylor Maasdam; fourth row, Corey McCoy, Jataya Meyer, Rebecca Morningstar, Camryn Russell, Hailey Scandridge, Mary Kate Shaver, Sierra Suiter, Aaron Van De Krol; fifth row, Jesse Van Wyk, Mariah Vos, Skyler Young, and Sage Zylstra. High school principal Mr. Shane Wheeler recognized scholastic medallions, and Ehresman announced honor graduates, valedictorian Mariah Vos and salutatorian Camryn Russell, who gave memorable speeches. The high school chorus performed “Oceans and Stars,” under the direction of Mrs. Franchesca Richter, K-12 music instructor, and accompanied by Louise Redding. Wheeler then presented the Class of 2018, and Dunsbergen presented the diplomas. With diploma in hand, graduates shared a memorable hug with proud parents before sitting with their class one more time. Once the tassels were flipped to the other side of their caps, graduates tossed their caps into the air and happily marched out of the gym to the recessional played by the L-S band under the direction of Ms. Victoria Hillabolt, band instructor. Outside, Lynnville-Sully’s newest alumni shared hugs, laughs, photos, and even some tears with proud family and friends in the congratulatory line. Congratulations, Class of 2018, and best of luck as you embark on your new journeys! 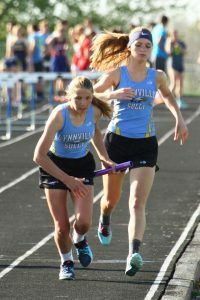 Those are just a few words L-S Coach Darin Arkema used to describe the Lynnville-Sully girls track team’s performances at the state-qualifying meet at BGM last Thursday, May 10. In an “absolutely remarkable night of competition,” the Hawks won the meet and qualified nine girls for state in seven events. Anyone who placed first at the state-qualifying meet automatically qualified for state. Those who did not place first had to wait until Friday morning to see if their times or marks put them in the top 24 in the state as at-large qualifiers. 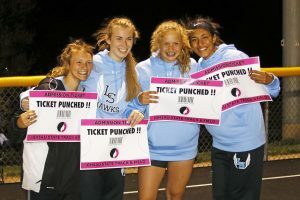 The smiles couldn’t be any wider as the L-S 4x100 team celebrates their state qualification, from left, Kaleah Ehresman, Camryn Russell, Korinne Jansen, and Jataya Meyer. All have competed at state before except for Jansen. It took until the final two events of the night before the L-S girls had automatic qualifiers in the 4x100 relay, followed by the 4x400 relay. The 4x100 team was sophomore Kaleah Ehresman, senior Camryn Russell, freshman Korinne Jansen, and senior Jataya Meyer, who ran a time of 52.31. The 4x400 team was freshman Caitlin Alberts, sophomore Mallory Loftus, junior Carson Fisk, and sophomore Abby Gruver. They finished with a time of 4:16.35. Three other relays and three individuals also qualified based on their times. The 4x200 placed second and earned a trip to state with the time of 1:51.41. The girls on this relay were Jansen, Fisk, Russell, and Meyer. Sophomore Abby Gruver placed second and senior Mariah Vos took fourth in the 400-m hurdles and made it to state based on their times of 1:09.72 and 1:11.08. The two girls have both run in the 400-m hurdles at state before – Gruver last year and Vos two years ago. Sophomore Abby Gruver clears a hurdle as the lead runner for the Hawks’ state-qualifying shuttle hurdle relay team. Gruver and Vos also qualified for state with Russell and Loftus in the shuttle hurdle relay based on their second-place time of 1:08.35. In the 100-m hurdles, Loftus placed fourth with a time of 16.75 and qualified for state for a second year. The sprint medley took fourth with a time of 1:56.62, which was also good enough for state. Team members were Ehresman, Meyer, Fisk, and Alberts. As a team, L-S finished in first at BGM with 104 points in a field of 14 teams. As a three-time state qualifier, Russell is one of three seniors who will finish the season at the 2018 Iowa State Track and Field Championship at Drake Stadium in Des Moines this week. 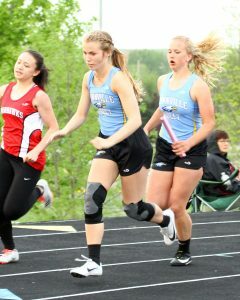 Freshman Korinne Jansen looks to pass on the baton to senior Camryn Russell in the 4x200 that qualified for state last week. Meyer, a two-time state qualifier, is looking forward to seeing what she and her teammates can do at state this Thursday through Saturday. Many Hawks contributed to the district win. Alberts ran the open 400 with a time of 1:05.81 for third. Freshman Megan Van Zante ran a time of 5:31.96 in the 1500, which put her in third as well. Shaver took fifth behind her in 5:40.77. Jansen took third in the shot (33’3.5”). In the 100-m dash, Ehresman ran a 13.57 and had a fourth-place finish. Senior Mary Kate Shaver finished fourth in the 3000-m run with a time of 12:11.22, followed by freshman Meleisha Vos in sixth in 12:58.96. Senior Haley Breeden took sixth in the 800-m run in 2:47.74. Another sixth-place finish was the 4x800 team of Breeden, junior Emily Van Gorp, senior Chris-tine Nikkel, and Van Zante. The Hawks’ only seventh-place finish of the night was the distance medley team of freshmen Jaden Brand and Cally Gibbs, sophomore Ashton Thompson, and Van Gorp with a time of 5:08.04. Freshman Dylann Huyser took eighth in the 200-m dash with a time of 30.12. Classmate Riley Terlouw finished in eighth in 14.29 in the 100-m dash. Members of the L-S girls track and field team celebrating their district meet victory and state qualifications are, from left, on knees: Madison Johnson, Haley Breeden, Camryn Russell, Christine Nikkel, Jataya Meyer, Mariah Vos, Mary Kate Shaver; second row: L-S Assistant Coach Jill Schuring, Abby Gruver, Hadley Tice, Caitlin Alberts, Cally Gibbs, Kaleah Ehresman, Kaylee Maasdam, Mallory Loftus, Jaden Brand, Carson Fisk, Megan Lu, Janelle Rozendaal, Korinne Jansen, Makayla Rozendaal, Ashton Thompson; back: Megan Van Zante, Krystal Van Dyke, Riley Terlouw, Dylann Huyser, Emily Van Gorp, Shaleah Van Wyk, Meleisha Vos, and L-S Coach Darin Arkema. The golf season will continue for the Lynnville-Sully girls golf team as well as for senior boy Holden Jansen after advancement in the first round of the postseason this past week. Jansen was the lone L-S boy who advanced past sectionals on Friday, May 11. 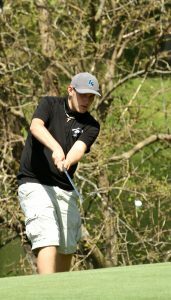 Earlier in the week, the L-S boys golf team traveled to New Sharon to face six conference schools. Despite improvement from lower-ranked golfers, the Hawks came in last with 221 points. Keota won the meet with 170 team points. Co-coach Jennifer Kramer commented on the team progress. “The lower-ranked boys are beginning to place consistent, and scores continue to lower with each meet,” she said. Junior Abram Collins’ chip shot sends his ball airborne as he competes as the L-S boys’ No. 2 golfer at sectionals. Junior Abram Collins led L-S and had his best round of the year. Collins shot par on multiple holes and ended the night with a 45. Senior Holden Jansen got off to a tough start and carded a 54. Juniors Cade Dibello and Logan Ingersoll both shot 61 for the final scoring spots. Freshman Luke Kramer struggled on hole five, carding a 65. Classmate Brandon Graham finished the night with a 66. On Friday, May 11, the Hawks were back at New Sharon for the sectional meet. The boys were able to lower their team score and send one golfer on to districts. As a team, L-S had 422 points. This earned them fourth, one place away from qualifying for districts as a team. Moravia won the meet with 357 points and will advance as a team to districts along with North Mahaska and Martensdale St. Marys. Jansen redeemed himself from the meet earlier in the week. He was consistent throughout all 18 holes to finish with an 83. 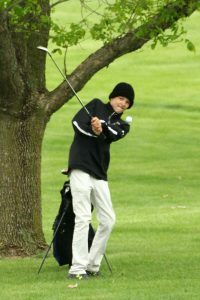 This earned him fourth and a spot at districts since he was second among the golfers of non-qualifying teams. L-S freshman Luke Kramer follows through on his swing while golfing at sectionals on Friday. He was the Hawks’ No. 4 golfers. Collins started strong but then began to fade in the second round. He carded a 97 and placed 13th. Ingersoll was able to reduce strokes on the second round to walk away with a 116. L. Kramer was the fourth and final scorer for the Hawks, carding a 126. Dibello finished the night with a 135. 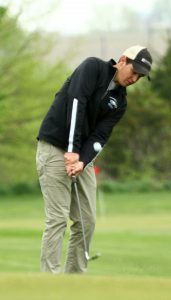 Jansen will be golfing for his chance to go to state at districts this Friday, May 18, at Crestwood Hills Golf Course in Anita. 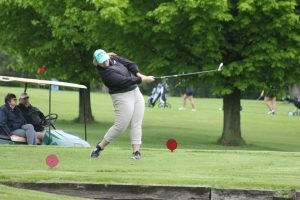 The L-S girls golf team knew they had to compete at their best if they wanted to advance past the first round of the regional tournament on Monday, May 14. After a hot 18 holes, the girls earned third to move on to the second round of regionals, set for Monday, May 21. Junior Tessa Van Maanen led the team with a score of 97. This placed her third, four strokes away from winning the meet. Senior Skyler Young hits her ball onto the green at the first round of regionals on Monday. She had her best nine holes of the season on the opening nine. Taking the oval at home on Tuesday, May 1, the L-S girls track and field team was looking to win a conference title. This was one of the few meets remaining before districts, and the Hawks ran really well in the field of 11, coming up just 2.5 points short in a loss to conference champion Montezuma. The Hawks won two events on the night. Those were the 4x200 and 4x400. The 4x200 team, who put together their best time of the season at 1:53.33, was made up of freshman Korinne Jansen, junior Carson Fisk, and seniors Camryn Russell and Jataya Meyer. The 4x400 team comprised of Fisk, sophomores Abby Gruver and Mallory Loftus, and freshman Caitlin Alberts ran a time of 4:19.49. Megan Van Zante takes off with the baton after an exchange with Christine Nikkel in the 4x800, which they won at Montezuma. The Hawks had three events – the shuttle hurdle, the 4x100, and the 100-m hurdles – earn second in the SICL. The shuttle hurdle relay was made up of Russell, Gruver, Loftus, and senior Mariah Vos. They ran a school record-breaking time of 1:09.59, moving them to second in the state. The 4x100 team finished in 53.59 seconds and included Russell, Jansen, Meyer, and sophomore Kaleah Ehresman. The final second-place finish was Loftus in the 100-m hurdles, who ran a time of 16.47, her fastest this year. The Hawks also had five third-place finishes. Those events were the sprint medley, 3,000-m run, 4x800, 400-m hurdles, and the 1500-m run. In the 3,000-m, senior Mary Kate Shaver ran a time of 12:07.55, and freshman Megan Van Zante ran the 1500-m in 5:42.12. The sprint medley relay finished in 1:57.96, their best this season, with team members being Ehresman, Russell, Fisk, and Alberts. In the 400-m hurdles, Gruver ran a time of 1:08.81, breaking her own school record set at the state-qualifying meet last year. To wrap up the third-place finishes, the 4x800 team of senior Haley Breeden, sophomore Emily Van Gorp, freshman Meleisha Vos, and Van Zante ran a season-best time of 11:19.53. There were plenty of other place winners on the night for the Hawks. Jansen received eighth place in the shot put with a throw of 30’3.5”. Senior Christine Nikkel placed eighth in the 3000-m run with a time of 13:45.53. In the 100-m dash, the Hawks had Jansen come in fourth (13.66 seconds) and Ehresman finish fifth (13.80 seconds). The team of Mariah Vos, freshman Cally Gibbs, Meyer, and Fisk placed fourth in the distance medley relay with a time of 4:51.81. Other place winners for the Hawks were Alberts and Gruver in the 400-m dash placing fourth and fifth respectively with times of 1:04.73 and 1:06.7. This was Alberts’ fastest 400 of the season. Breeden finished fifth in the 800-m run with a time of 2:46.91. In the 200-m dash, Loftus earned fifth with a time of 28.70. Mariah Vos placed fifth in the 400-m hurdles in 1:15.67. Then in the 1500-m run, her sister Meleisha ran a time of 5:57.16, good enough for sixth place. 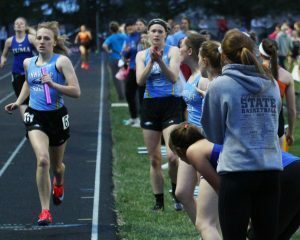 With teammates cheering her on from inside the track, Abby Gruver anchors the 4x400 at the SICL meet last week. The L-S 4x400 had the fastest time in the conference that night. To finish the week, the girls went to the Cardinal Relays in Newton for a coed meet on Friday, May 4. The meet was scheduled for Thursday, May 3, but due to weather was moved to Friday. The weather was great, the meet went smoothly, and the team finished third with 113.5 points behind PCM (170) and Newton (160). Two L-S individual events placed first at Newton — Alberts in the 400-m dash in 1:05.13 and Gruver in the 400-m hurdles in 1:09.10 after a three-person photo finish. L-S won one relay event, the 4x100, with teammates Ehresman, Russell, Fisk, and Meyer, clocking a time of 53.17 seconds. “We had smooth hand-offs and were .03 seconds off from beating our personal record for the year. It is super fun to be able to run with these girls and continue to get better. I am very excited to see what districts will bring us,” said Meyer. Two Hawk relays came in second. The sprint medley runners of Ehresman, Meyer, Fisk, and Loftus finished in 1:58.20 for second place. Meyer joined with Jansen, Russell, and Fisk to also take second in the 4x200 in 1:53.38. In 100-m hurdles, Loftus and Russell took third and sixth respectively in 16.99 and 17.99 seconds. The only Hawk to run the 3,000-m was Van Zante with a time of 13:21.94, which earned her third. The 4x800 relay of Shaver, Van Gorp, senior Christine Nikkel, and junior Shaleah Van Wyk finished in a time of 11:35.56 and placed fourth. In the 100-m dash, Huyser placed fourth in 14.04. The distance medley team of Brand, Gibbs, Breeden, and Van Gorp ran a time of 5:07.54 for fourth. Running in the 400-m hurdles, with Gruver, Mariah Vos crossed the line with a time of 1:13.81 in fourth place. Two girls ran their season bests to place in the 800-m dash. Van Zante placed fifth with a time of 2:46.37, and Breeden ran a 2:47.80, which earned her sixth. In the 200-meter dash, Alberts ran the race in 29.42 for fifth, and Ehresman ran one-hundredth of a second slower for sixth. In the field events, freshman Krystal Van Dyke long jumped 14’3.75’’, her best of the season, which tied for fifth. In shot put, Jansen threw 31’7’’ for sixth. In discus, sophomore Janelle Ro-zendaal earned fifth with her best throw this season of 89’02’’. A few non-scored JV events were also held. The 4x100 runners of senior Madison Johnson, Rozendaal, freshman Jaden Brand, and Jansen placed first in their heat in 59.45 seconds. The JV sprint medley team of freshmen Riley Terlouw, Brand, Dylann Huyser, and Cally Gibbs finished in 2:08.79, earning them first in their heat. The L-S JV 4x100 team of Terlouw, Van Dyke, Gibbs, and Huyser placed second in their heat in 56.63. In their final event before the state-qualifying meet, the L-S girls placed third at the Darrell Brand Relays in Montezuma on Monday, May 7. L-S finished with 113.75 points behind Montezuma (148) and Belle Plaine (134). One highlight from the night was Jansen winning the shot put with a heave of 31’0.5”. The other first-place finish for L-S came in the 4x800. Breeden, Van Gorp, Nikkel, and Van Zante dominated in 11:22.18. Distance events were a strong suit for the Hawks. Shaver and Van Zante went two-and-three in the 1500-m in 5:40.66 and 6:00.32. Another two-and-three finish came from Gruver and Mariah Vos in the 400-m hurdles in 1:10.22 and 1:13.56. Meleisha Vos was the second finisher in the 3,000 with at time of 13:02.80. Other second-place finishes were earned by the sprint and distance medleys. Ehresman, Meyer, Fisk, and Gibbs ran the sprint medley in 2:02.16, and Huyser, Brand, sophomore Ashton Thompson, and Meleisha Vos crossed the finish line of the distance medley in 5:07.53. 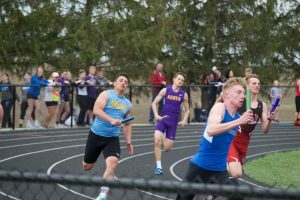 Events that placed third are following: Riley Terlouw, 100-m dash, 14.17; 4x100 (Ehresman, Gibbs, Terlouw Huyser), 55.60; 4x200 (Jansen, Russell, Fisk, Meyer), 1:53.64; and shuttle hurdle (Gruver, Mariah Vos, Russell, junior Kaylee Maasdam), 1:13.39. Breeden and Tice went four-and-five in the 400-m dash with times of 1:11.81 and 1:12.39. In the 800-m run, Van Wyk and Tice placed fifth and sixth respectively in 3:10.51 and 3:33.21. The 4x400 team members (Thompson, Nikkel, Van Gorp, Van Wyk) placed fourth in 5:00.60. Rozendaal threw the discus 87’6” for fifth place, and Huyser earned sixth in the 200-m dash in 30.07 seconds. In a non-scored event, the 4x100, comprised of the same runners from the Cardinal Relays, again won their race, clocking a time of 1:00.12. 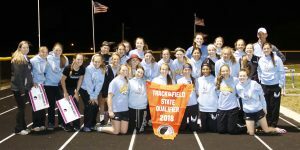 The meet at Montezuma was used as a final tune-up for the girls as their next event is the state-qualifying meet at BGM this Thursday, May 10. 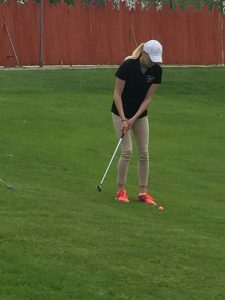 The inexperience of the Lynnville-Sully golf teams showed at the South Iowa Cedar League golf meet held at Oakland Acres near Grinnell on Monday, May 7. Both the boys and girls teams struggled throughout the 18 holes and finished behind all other conference teams. Individually, however, junior Tessa Van Maanen played right with the competition and finished the meet in fifth place in the conference. Van Maanen earned fifth place after a consistent 18 holes. She scored between 4-6 on all but one hole, carding a 48 on the front nine and 47 on the back nine for a total of 95. The L-S girls went up against seven other conference teams and finished the night in eighth place with a team score of 529. Iowa Valley won both boys and girls titles with 339 and 372 respectively. L-S junior Kayla Van Dyke plays the course at Oakland Acres for the SICL meet Monday. She had the L-S girls’ second best score. The other Hawk girls struggled at Oakland Acres and had some holes with double digits. Junior Kayla Van Dyke averaged 7.6 strokes per hole for a final score of 137. She shot a 67 on the front nine and a 70 on the back nine. Senior Hailey Scandridge got off to a rocky start, shooting double digits her first two holes. She ended the night carding 141. Junior Maddeline Mintle was the fourth and final golfer for the Hawks. A solid 66 on the front nine was spoiled by a 90 on the back nine. Mintle’s final score added up to 156. On the boys’ side, L-S totalled 448 team points, placing them 11th out of 11 schools. Senior Holden Jansen was the Hawks’ top golfer. He hit par multiple times throughout the round, including the final two holes, 17 and 18. The senior carded a 51 on the front nine and a 46 on the back nine for a total of 97. To place in the top 10 for conference honors, he needed to shoot an 86 or better. Junior Abram Collins started the day with a birdie and two pars but was unable to remain consistent throughout the round. He finished the day carding a 104. A chip shot sends junior Logan Ingersoll’s ball onto the green at the conference meet at Oakland Acres on Monday. Ingersoll carded a 113. Junior Logan Ingersoll shot a solid round, carding a 58 on the front nine and 55 on the back nine for a total of 113. Classmate Cade Dibello finished the day after 134 strokes. Freshman Luke Kramer found him-self in trouble on the front nine holes, carding a 73. He was able to make adjustments and improvements for the back nine and cut off nine strokes to give him a total of 137. 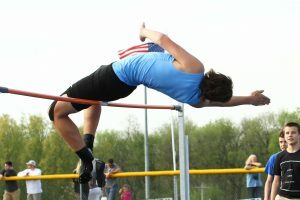 The Hawks’ other meet in the past week was also at Oakland Acres and was held the Thursday before the conference meet. That meet, which had been postponed from Apr. 9 and 24, cancelled after seven holes due to the weather. Senior Hailey Scandridge putts at Oakland Acres during the meet last week that was cancelled after seven holes due to weather. 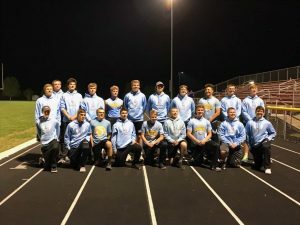 The Lynnville-Sully boys proved themselves as one of the best teams in the conference by earning second out of 11 teams at the SICL meet on Tuesday, May 1. The Hawks had the advantage of hosting the meet and were runner-up with 108.5 points behind Belle Plaine’s 155.5 points. L-S won two running events at the conference meet. The shuttle hurdle team was the fastest in the conference with a time of 1:00.27, and was run by senior Carson Dunsbergen, junior Tyson Vander Linden, senior Corey McCoy, and junior Gage Vander Leest. Senior Corey McCoy jumps a hurdle on his way to winning the 400-m hurdles at Montezuma. Vander Leest was also a conference champ in the 110-m high hurdles, earning first in 15.64. The field events scored many points for L-S. Junior Rylan James earned the conference title in the shot put with a throw of 48’01”, and junior Grant Wehrle placed fourth with a throw of 41’3.5”. Senior Drake Ehresman was the conference champ in the high jump, clearing 5’10”, while senior Carson Dunsbergen tied for third with a jump of 5’8”. Ehresman placed second in the long jump with a leap of 19’11.5”, and sophomore Kinnick McFarland placed eighth with a 17’08” jump. Senior Jesse Van Wyk threw 116’04” in the discus for seventh with James right behind him in eighth (114’4”). L-S had several events come up just short of first place. The 4x100 team tied for second with a time of 45.50 and was run by Vander Leest, senior Sage Zylstra, junior Nate Stock, and McCoy. McCoy also placed second in the 200-m dash in 23.72 and was a part of the sprint medley team with senior Kemper Lukehart, Zylstra, and Stock that earned second in 1:39.9. In the 400-m hurdles, Carson Dunsbergen placed fourth with a time of 1:01.89. The 4x800 medley relay also placed fourth with a time of 9:25.84 and was run by junior Hannes Van der Meer, senior Cody Gibbs, McFarland, and junior Ty Breeden. Junior Nate Stock runs his leg of the 4x200 at the conference meet last Tuesday. L-S placed sixth in the event. Van der Meer placed fifth in the 800-m run with a time of 2:15.25, and Zylstra was clocked at 11.95 seconds in the 100-m dash for fifth. Vander Leest, McFarland, Van der Meer, and Carson Dunsbergen ran the 4x400 in 3:49.04 for fifth. The 4x200 team (sophomore Ethan Wyma, Zylstra, Mc-Farland, and Stock) placed sixth with a time of 1:40.48. The distance med-ley relay came in eighth with a time of 4:16.41. Runners were Lukehart, Jesse Van Wyk, Breeden, and freshman Blake Rea. Gibbs placed eighth in the 1600-m run with an overall time of 5:31.16. 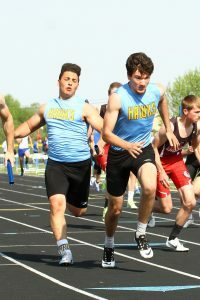 Two Hawks – Vander Linden and Ehresman – suffered injuries at the conference meet so did not compete in as many events as normal. Later in the week, the Hawk boys traveled to Newton for the 60th annual Newton Cardinal Relays. 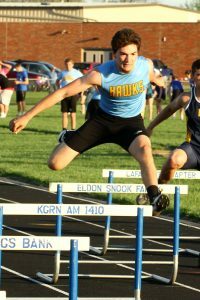 With Vander Linden and Ehresman still injured and a few other athletes not in attendance, the Hawks were still able to find success around the track and in the field events. L-S finished sixth out of eight with several bigger schools finishing at the top. The meet was originally supposed to take place on Thursday, May 3, but due to bad weather, the meet was moved to Friday. Just like earlier in the week, Vander Leest earned first in the 110-m high hurdles with a time of 15.70. Another first-place finish was earned by McCoy, who ran the 400-m hurdles in 57.04. Rea finished behind him in sixth with a personal best time of 1:04.95. As they’ve done all year, the field events accumulated a lot of points for the Hawks. James earned second in the shot put with a throw of 46’7” and third in the discus with a personal best of 128’02”. Jesse Van Wyk placed sixth in the discus with a throw of 117’. Carson Dunsbergen jumped 5’4” in the high jump to take sixth and leaped 18’8.25” in the long jump to place fourth. McFarland jumped a personal best of 18’5.25” to place eighth in the long jump. To start off the running events, the Hawks earned fourth in the sprint medley. Zylstra, Stock, Vander Leest , and Hannes Van der Meer put up a time of 1:46.09. In the shuttle hurdle relay, the Hawks placed fifth in 1:05.49. Team members were Carson Dunsbergen, Vander Leest, McFarland, and Rea. Zylstra, Stock, Breeden, and Gibbs ran in the distance medley relay and got fifth with a time of 4:05.79. In the 4x200 relay, Wyma, Jesse Van Wyk, Rea, and McFarland came in sixth with a time of 1:45.10. Every year at the Cardinal Relays, they have a weightmen’s 4x100. This relay must consist of just throwers, and whoever wins gets free pizza from the concession stand. With a time of 51.66, the relay of Squires, Jesse Van Wyk, junior Grant Wehrle, and James finished in fourth place. There was also a regular 4x100 relay which consisted of Carson Dunsbergen, McCoy, Stock, and Vander Leest. They finished in fourth in 46.42 seconds. In the last event of the night, McFarland, Breeden, Wyma, and Gibbs ran in the 4x400 and finished in sixth with a time of 4:01.06. On a beautiful Monday night, May 7, the L-S boys headed to Montezuma for the last track meet before the district meet. Like the Tuesday before, L-S placed second behind Belle Plaine. The Hawks won six events at the Darrell Brand Relays, with three of those wins coming from the field events. McFarland won the long jump with a leap of 17’9.5”. James set a personal record of 48’9” while claiming the shot put, and Carson Dunsbergen cleared the bar set at 5’10” to win the high jump. Other field events that placed were James in the discus (fourth, 120’), Jesse Van Wyk in the discus (fifth, 111’7”), Wehrle in the shot put (fourth, 38”11”). Three L-S athletes won individual running events at Montezuma. Vander Linden was back competing to claim the 400-m dash in 55.37 seconds. Vander Leest earned first in the 110-m hurdles in 16.02 seconds. In the 400-m hurdles, McCoy and Rea went one-and-four with times of 57.63 and 1:05.26. Other individual results included Gibbs placing third in the 1600 in 5:23.57, Squires finishing fifth in the 100-m dash in 12.88 seconds, and Breeden coming in sixth in the 800-m dash with a time of 2:26.73. The top finish in the L-S relays came from the distance medley team of Wyma, Breeden, Carson Dunsbergen, and Gibbs. They earned second in 4:05.03. The 4x100 team (Vander Leest, Stock, Carson Dunsbergen, Zylstra) clocked a time of 46.47 for third. The 4x100 weightmen’s team (Lukehart, James, Squires, Jesse Van Wyk) earned first in their heat. In other relays, the sprint medley grabbed third in 1:39.98. Runners were Zylstra, Stock, McCoy, and Vander Leest. The 4x400 team (McFarland, Ehresman, Wyma, Breeden) crossed the finish line in fourth in 3:55.61. McFarland, Rea, freshman Carter Dunsbergen, and Lukehart placed fifth in the shuttle hurdle relay in 1:15.20. Another fifth-place finish came from the 4x200 team (freshman Payton Van Wyk, Jesse Van Wyk, Lukehart, Wyma) in 1:47.43. The Hawks have now turned their focus to the state-qualifying meet that will take place at BGM this Thursday, May 10. Go Hawks!